HomeGet Updates on New Listings! Please use the form below to subscribe to our Ad Updates mailing list. 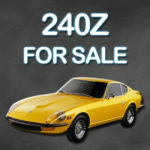 This is our exclusive email list that we use to notify you when we do a big classifieds scrub and add a bunch of new Datsun 240Z ads to our site. Don’t worry we will not spam you or sell your information to anyone else. Additionally we only send out ad updates roughly once per week or so. We still recommend you subscribe via our RSS feed for instant updates or follow us on any of the following social media platforms for daily updates as we post one off ads and update existing listings.